New Delhi: An anonymous telephone bidder bought 24 rare preparatory paintings depicting Tipu Sultan's 'Battle of Pollilur' in India for an astounding sum of 769,250 pounds ($1.2 million) at the Sotheby's bi-annual "Arts of the Islamic World" sale Wednesday, a statement by the auction house said. Edward Gibbs, senior director and head of Sotheby's Middle East department, said the "price achieved for the exceptional pictorial accounts of the 'Battle of Pollilur' was true confirmation of their historical importance and rarity". "Tipu Sultan was an extraordinary individual and an Indian national hero. These paintings record his finest hour when he defeated the British in the field of battle in 1780," Gibbs said. The sale that generated global interest saw bidders from several Islamic nations. The collection of 24 preparatory paintings depict the 'Battle of Pollilur' in India in which the East India Company army surrendered to Tipu Sultan and his father Haidar Ali. The British army suffered high casualties. This year marks the 230th anniversary of the 'Battle of Pollilur' won by Tipu Sultan on Sep 10, 1780. The paintings that show Tipu Sultan and his father Haider Ali marching to battle in full regalia were acquired by Captain John William Freese in 1802. In 1802, he was appointed by Gen Stuart as commissary of stores at Seringapatam. By descent the paintings went to Sixth Earl of Lanesborough (grandson of Captain Freese) and remained in the family for a further 100 years until they were sold as part of a group lot in the Swithland Hall Estate Sale in 1978 on behalf of the Ninth Earl of Lanesborough. On the penultimate day of journey, the Queen's Baton Relay 2010 was cheered by Delhiites, whereever it went. 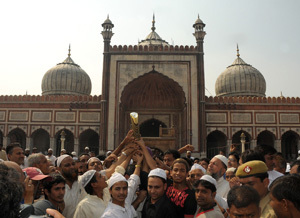 When the baton reached the historic Jama Masjid in New Delhi on October 02, it was greeted by a large number of Muslim worshippers.